The second clash of VIVO Indian Premier League witnessed a low-scoring scenario as Kolkata Knight Riders put in Delhi Daredevils to bat first after winning the toss and later, wrapped them up at a handful score of just 98 runs with Andre Russell and Brad Hogg leading the pace and spin department from the front respectively. KOLKATA: Breaching Kolkata Knight Riders at their fortress – Eden Gardens is one of the toughest thing to do and last night was no different when Captain Gautam Gambhir won the toss and decided to put in Delhi Daredevils to bat first, knowing the conditions thoroughly and later what everyone witnessed was a disaster. The start of Delhi Daredevils' innings was not as bad as it’s climax. Quinton de Kock started off well as he is known for but things never really seemed to be in DD's favor once they lost his wicket. Kolkata Knight Riders' bowlers made sure that no batsman would be able to settle in and become a problem for them later. Even, Delhi Daredevils' batsmen were lacking that content to go there and score big for the team which helped to the cause for Skipper Gautam Gambhir and his knights. Eden Gardens witnessed a perfect combo of pace and spin as Andre Russell and Brad Hogg ended up picking 3 wickets each. Credits to their supreme bowling which made sure that Delhi Daredevils don’t even manage to enter the three digits at Eden Gardens. Chasing 99 was not at all a big task for Kolkata Knight Riders, looking at the way Knights walked in. The confidence on their faces and batting approach was visible. Gautam Gambhir and Robin Utthappa‘s 69-runs opening stand made things easier for Manish Pandey, who came in and finished off the things in style alongside Skipper Gambhir even before the end of 15th over. Andre Russell was awarded as Man of the Match for his fiery seam bowling which earned him wonderful figures of 3-0-24-3 at an economy rate of 8.00! Skipper Gautam Gambhir looked delighted to kick-off his VIVO IPL campaign with a win and was in all praises for his spearhead – Andre Russell. “Russell got to Kolkata this morning and the way he started with the ball was commendable. He is a quality player for sure!”, he said. 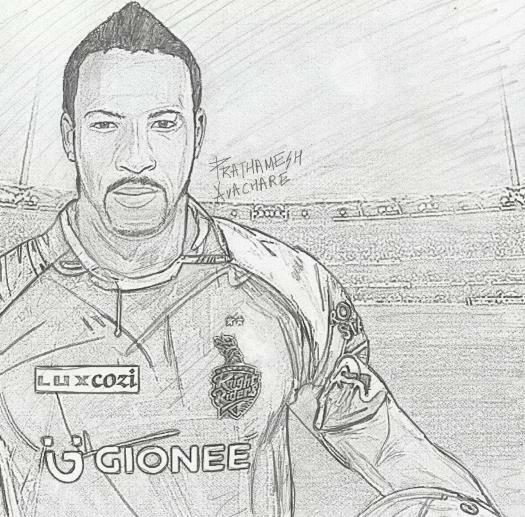 Andre Russell has always been a worthy player to watch out for me. He has got some really good all-round skills which adds value to his side. It will be exciting to watch how he evolves with bat and bowl both as the tournament progresses!